Ewen Callaway discusses ethical issues surrounding the publication of an Australian Aborigine full genome sequence from a hair sample collected about a hundred years ago by a British scientist. "To be sequencing DNA from the hair of a deceased indigenous person is uncharted ethical territory," says Emma Kowal, a cultural anthropologist at the University of Melbourne. Sequencing DNA from the hair of a deceased indigenous person is nothing new. Scientists have done it, for example, on Napoleon's hair. But, of course, "indigenous", is a code word for pre-European. Everyone's genome is a composite of bits that have arrived at different times from different places. There is nothing "indigenous" about any of our DNA, unless we believe in fables like that of Erichthonius. What is the use of the concept of "indigeneity"? To make cultural anthropologists feel good about their role as protectors of "indigenous people". Of course, I believe that anthropologists should not just go ahead and get DNA from the dead. But, as far as I can tell, Haddon did not go around the world with a pair of scissors chasing after people for hair samples. Nor are there, as far as I can tell, any close relatives of the deceased that might object to his full genomic sequence (and by implication half, or a quarter of their sequence) being published. So, where is the ethical problem? But some scientists are jittery about how others in the Aboriginal community might receive the project, and worry that it could set back efforts to engage Aboriginals in genetic research. "In a sense, every Aboriginal Australian has had something about themselves revealed to the world without their consent," says Hank Greely, who directs the Center for Law and the Biosciences at Stanford University in California. Aboriginal Australians endured centuries of repression by European colonists, but their wariness of genetic research owes much to the Human Genome Diversity Project (HGDP). This 1990s international collaboration aimed to catalogue the genetic diversity of populations worldwide, but sparked concerns that indigenous peoples were being subjected to neocolonial 'bioprospecting'. "Probably the strongest opposition we ran into anywhere in the world" was in Australia, says Greely, who was an ethical adviser to the project. Plans to include Aboriginal Australian DNA were eventually scrapped, and the furore's impact continues to reverberate, says Kowal. "The damage that the HGDP has done for the prospect of doing genetic research with Aboriginal people has been significant." Researchers who work with Aboriginal Australians are now expected to obtain consent not only from the individuals concerned, but also from local and sometimes state-wide groups representing Aboriginal communities across Australia. I believe in empirical evidence. There are dozens of human populations represented in the Human Genome Diversity Panel that have been used and re-used by scientists and amateurs like myself alike. Can any of the professional kind souls point to a single bad thing that has happened to any of these populations because of it? What about the rights of individual Aboriginal Australians? Suppose that you are an Aboriginal Australian who wants to learn about his ancestry and origins, the same with all those Europeans, Africans, Asians, etc. who buy genetic ancestry tests or visit genealogy, archaeology, and history forums. Why should your natural desire to learn about your own past, and the natural desire of anthropologists and geneticists to learn about human history have to go through the bureaucracy of community- and state-level "representatives"? A Danish bioethical review board did not believe it was necessary to review the project because it viewed the hair as an archaeological specimen and not a biological one, Willerslev says. However, after his team sequenced the genome, an Australian colleague put Willerslev in touch with the Goldfields Land and Sea Council, a body based in Kalgoorlie, Western Australia, that represents the 5,000 or so Aboriginal Australians living in the region where Haddon collected the hair sample. In June, Willerslev flew to the region to describe his project to the organization's board and to seek its approval. He says that if the board had rejected his proposal, he would have ended the project and left the genome unpublished. I am glad that the "Land and Sea Council" gave Willerslev its consent. But, seriously, who are they to decide whether the hair sample should be used or not? It could be argued that Haddon's unknown hair donor did not authorize a particular use of his hair sample. But, it is ludicrous to expect people from the past to anticipate all the potential uses that their tissues may have in the future. Nor is there any evidence that the anonymous donor authorized some council representing 5,000 future Aboriginal Australians, including a few of his distant relatives to prevent it from being used. Despite Willerslev's efforts, "I would suggest there would be a certain amount of unrest in the indigenous communities", says van Holst Pellekaan. Greely agrees that Willerslev's team should have reached out to other Aboriginal groups. So, it is not only sufficient for the future local council to get in on the consent action, but it is proposed that the one from the next town, or halfway around Australia should be involved too. Scientists should not victimize DNA donors or their communities, but neither should they acquiesce to a never-ending political game of "consent", whereby they must appease every busybody elected or unelected "representative" before doing their work. "I think they did everything anyone could reasonably expect them to," counters Mark Stoneking, a molecular anthropologist at the Max Planck Institute for Evolutionary Anthropology in Leipzig, Germany. He published a complementary analysis of Aboriginal genomes last week, using DNA samples obtained by other scientists with the consent of the Aboriginal Australian individuals involved. But, I would argue that they did more than anyone could reasonably expect them to. Since there is no evidence that the sample was collected illegally and unethically, and since the Danish review board approved the study, there would have been no reason not to publish the study if the "Goldfields Land and Sea Council" had objected. I would be pissed if I was a member of the research group that did all this work without intending or actually causing harm to anybody, and I was told not to publish because some council said so. Moreover, the issue is one of basic scientific integrity: scientists should seek to understand the world as it is, including patterns of human diversity and history. Suppose that Willerslev had reached a different conclusion, e.g., that Australian Aborigines arrived 5,000 years ago, and this was rejected by local interest groups because it clashed with their oral histories. Are scientists only to publish results that are acceptable to studied populations' traditions and mythologies, and be prevented from publishing those that falsify them? Having a set of widely accepted guidelines for studying such samples would help to guide researchers, journals and funding agencies, says Stoneking. "Hopefully some sort of standards can be developed so everyone feels comfortable going ahead with this research," he says. To prevent researchers from engaging in unethical behavior. We don't want scientists to get people's DNA and then use it against them in a demeaning manner, or profiting from its potential commercial uses. The only case where the fit is not almost perfect is that of the Chuvashs, who are the most northern population. It is easy enough to discover the cause of this. 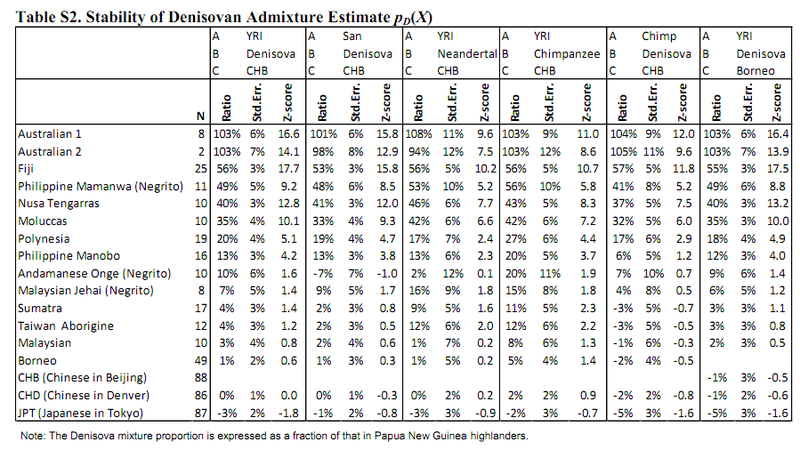 Chuvash have ~1.1% South Asian, as opposed to ~8.2% in the Uzbeks. There is a north-south latitudinal cline of the "South Asian" component in middle Eurasia, and the ancestors of the Chuvash moved at the northern end of that cline; of the Uzbeks at the middle. Notice that Turks, Uzbeks and the pair of Altai and Dolgan fall along one line, while Chuvashs, Russians, and the pair of Altai/Dolgan along another. So, the data seems consistent with the idea that the primary source of the westward Turkic expansions was something like the Altai (pics) and Dolgan, undergoing transformations and successive admixtures all the way to the Mediterranean and eastern Europe. 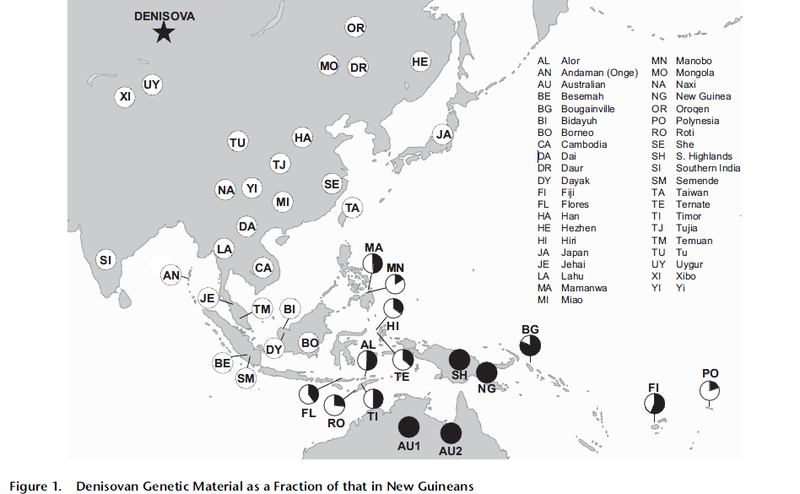 MtDNA SNP multiplexes for efficient inference of matrilineal genetic ancestry within Oceania. Ballantyne KN, van Oven M, Ralf A, Stoneking M, Mitchell RJ, van Oorschot RA, Kayser M.
Human mitochondrial DNA (mtDNA) is a convenient marker for tracing matrilineal bio-geographic ancestry and is widely applied in forensic, genealogical and anthropological studies. In forensic applications, DNA-based ancestry inference can be useful for finding unknown suspects by concentrating police investigations in cases where autosomal STR profiling was unable to provide a match, or can help provide clues in missing person identification. Although multiplexed mtDNA single nucleotide polymorphism (SNP) assays to infer matrilineal ancestry at a (near) continental level are already available, such tools are lacking for the Oceania region. Here, we have developed a hierarchical system of three SNaPshot multiplexes for genotyping 26 SNPs defining all major mtDNA haplogroups for Oceania (including Australia, Near Oceania and Remote Oceania). 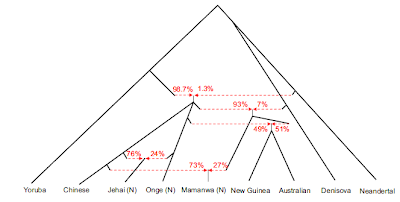 With this system, it was possible to conclusively assign 74% of Oceanian individuals to their Oceanian matrilineal ancestry in an established literature database (after correcting for obvious external admixture). 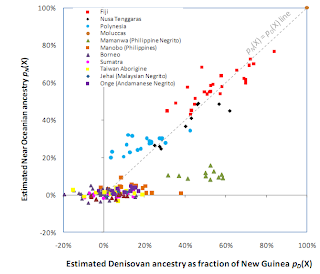 Furthermore, in a set of 161 genotyped individuals collected in Australia, Papua New Guinea and Fiji, 87.6% were conclusively assigned an Oceanian matrilineal origin. 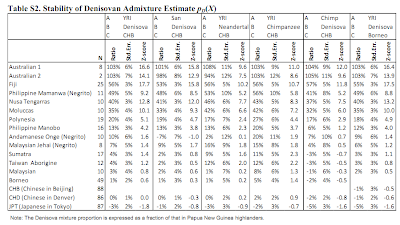 For the remaining 12.4% of the genotyped samples either a Eurasian origin was detected indicating likely European admixture (1.9%), the identified haplogroups are shared between Oceania and S/SE-Asia (5%), or the SNPs applied did not allow a geographic inference to be assigned (5.6%). Sub-regional assignment within Oceania was possible for 32.9% of the individuals genotyped: 49.5% of Australians were assigned an Australian origin and 13.7% of the Papua New Guineans were assigned a Near Oceanian origin, although none of the Fijians could be assigned a specific Remote Oceanian origin. The low assignment rates of Near and Remote Oceania are explained by recent migrations from Asia via Near Oceania into Remote Oceania. Combining the mtDNA multiplexes for Oceania introduced here with those we developed earlier for all other continental regions, global matrilineal bio-geographic ancestry assignment from DNA is now achievable in a highly efficient way that is also suitable for applications with limited material such as forensic case work. five individuals who were associated with four different haplotypes. was designated as D5 by the mutation at site 16 189 (T to C). A4, F1b, G1a, M9a, M10 and M8z, were each present in one individual. any product from two samples (S5 and S14) (Table 3). In order to study the genetic characteristics of the Lower Xiajiadian culture (LXC) population, a main bronze culture branch in northern China dated 4500–3500 years ago, two uniparentally inherited markers, mitochondrial DNA and Y-chromosome single-nucleotide polymorphisms (Y-SNPs), were analyzed on 14 human remains excavated from the Dadianzi site. The 14 sequences, which contained 13 haplotypes, were assigned to 9 haplogroups, and Y-SNP typing of 5 male individuals assigned them to haplogroups N (M231) and O3 (M122). The results indicate that the LXC population mainly included people carrying haplogroups from northern Asia who had lived in this region since the Neolithic period, as well as genetic evidence of immigration from the Central Plain. Later in the Bronze Age, part of the population migrated to the south away from a cooler climate, which ultimately influenced the gene pool in the Central Plain. Thus, climate change is an important factor, which drove the population migration during the Bronze Age in northern China. Based on these results, the local genetic continuity did not seem to be affected by outward migration, although more data are needed especially from other ancient populations to determine the influence of return migration on genetic continuity. This seems like a tie-in to another recent post on Neolithic and Bronze Age Ukraine. I don't think even a science fiction writer could have predicted the kinds of ancient DNA results we are getting from Europe. We have genetic discontinuity between Paleolithic and Neolithic, and between Neolithic and present, and, apparently, discontinuity between Neolithic cultures themselves, and wholly unexpected links to East Asia all the way to Central Europe. UPDATE (8 Jun 2012): The age of these remains has been questioned. Analysis of mitochondrial mutations in the HVS-I region is an effective method for ancient human populational studies. Discontinuous haplotype data between the first farmers and contemporary Europeans has been described before. Our contribution is based on a survey initiated on the Neolithic skeletons from Hungarian archaeological sites in the Alföld. This Lowland, the Hungarian Plain, is well excavated as an important region for spread of Neolithic culture from Near East and Balkans toward Central and Western Europe, started circa 8000 years ago. HVS-I sequences from nt15977 to nt16430 of 11 such specimens with sufficient mitochondrial DNA preservation among an extended Neolithic collection were analysed for polymorphisms, identifying 23 different ones. After assigning all single-nucleotide polymorphisms, a novel, N9a, N1a, C5, D1/G1a, M/R24 haplogroups were determined. On mitochondrial control mutations at nt16257 and nt16261, polymorphic PCRs were carried out to assess their distribution in remains. Neolithic data set was compared with contemporary Vác samples and references, resulting in higher frequency of N9a in Alföld as a remarkable genetic discontinuity. Our investigation is the first to study mutations form Neolithic of Hungary, resulting in an outcome of Far Eastern haplogroups in the Carpathian Basin. It is worth further investigation as a non-descendant theory, instead of a continuous population history, supporting genetic gaps between ancient and recent human populations. Aboriginal Australians (AA) have been somewhat of a black hole in population genetics research. So, it's great news that after today's Reich et al. paper on Denisova admixture, there is another new paper that presents the first full genome sequence of an aboriginal Australian. I don't know why it has been so difficult to study AAs so far; my guess is that some type of politics has prevented it, similar to those that have hindered population genetics research in some Amerindian groups. Unfortunately, the current publication does not seem to represent the beginning of a new era in AA research, as the genome does not belong to a living AA, but rather to a 100-year old hair sample. On one hand this makes sense: old DNA is preferable to fresh one when one deals with populations that have undergone admixture in recent times. I don't know how many AA have European admixture, but my guess is that, surely, pure-blooded living AA still exist, so, one could in principle obtain DNA from them. Nonetheless, we should be thankful for the new data which provide a much needed new data point of mankind's diversity. Also, given recent developments, even a single genome may prove to be invaluable. The supplementary material (pdf) has, as usual, most of the interesting details of the paper. Based on how our model was set up, the European-Aboriginal Australian and African-Aboriginal Australian split times that we presented above could be no less than 2,000 and 3,500 generations ago, respectively. So, at most the data shows that Europeans are closer related to East Asians than either of them is to Australian aboriginals. The actual ages in years are conditioned on the timing of the aforementioned events, which, in turn, have been estimated in the past using various assumptions (see my recent post on Gronau et al. 2011). There is a series of interesting papers on Amerindian populations in the early view section of the American Journal of Physical Anthropology. One of them struck my interest, because it deals with an issue that has been a familiar topos of this blog, and has, in my opinion, much greater potential applicability than the settlement of the Americas. The basic idea of the paper is the following: the serial founder effect (SFE) is a model, whereby populations expand by successive splits, with daughter populations expanding and colonizing new territories. It is a tree model, with the nodes furthest from the root representing late founder populations, and the ones closest to the root representing early splits close (geographically and temporally) to the initial colonization impetus. Gene identity is the probability that two random alleles from either two individuals in a population, or from two individuals from different populations will be identical. This has been used to argue for a SFE in the Americas, because it apparently matches expectations: the most basal populations are in north America, and gene identity increases toward south America. However, the authors of the current paper show that the observed pattern is due to European admixture in native American populations; this makes the north American populations (that are more European-admixed and hence more different than the rest) appear both more basal and more diverse. Many aspects of the pattern of neutral genetic variation in the Americas are consistent with the predictions of the serial founder effects process. The NJ tree is rooted in northern North America, it shows a northsouth pattern of internal branching, and gene identity within populations increases steadily with increasing geographic distance from Beringia. However, admixture with Europeans could account for all of these features. The tree is rooted in northern North America because the gene identities between the three northern North America populations and the other Native American populations are particularly low (Fig. 2). European admixture has contributed to this low identity, and, in principle, it could account for the position of the root. The Admixture tree (Fig. 5A) topology indicates that the north-south pattern of branching in the NJ tree might be the result of relatively high admixture in northern North America, intermediate levels in Central America and northern South America, and low levels in eastern South America. The partial correlation analyses show that the north-south increase in gene identity within populations can also be explained by geographically patterned admixture (Table 2). 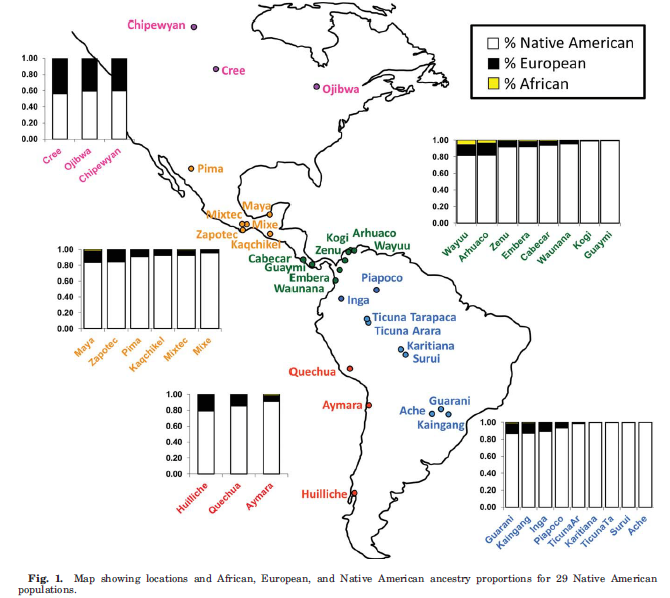 We conclude that geographically patterned admixture between Native Americans and Europeans has obscured our ability to reconstruct precontact evolutionary processes in the Americas. Of course, this is an extremely important piece of work that future studies of Amerindian populations must take into account. It is no longer feasible to interpret the observed gene identity pattern in the Americas as a remnant of the migration and spread of Amerindian ancestors thousands of years ago. It is more likely a result of much more recent events, namely the different intensity of European admixture in post-1492 times. Hunley and Healy is important not only for the Americas, however. The serial founder effect has been evoked to explain both the spread of modern humans from east Africa, as well as more recent Neolithic expansions in different parts of the world. We must now be vigilant that these patterns may, in part, be the result of latent admixture. In the Americas, we know (from historical documents) that this admixture took place, and we have relatively unadmixed populations still in existence. But, there may very well have been admixture events before the birth of history, and many ancestral populations may no longer exist in unadmixed form. So, we may be interpreting patterns of modern human variation as the result of ancient colonization processes, oblivious to the presence of latent admixture. For example, there is an increase in gene identity from eastern Africa through Arabia, and India, all the way to Siberia, and southward across the Americas. Hunley and Healy deal with the latter part of this cline, but the whole of it has been interpreted as evidence of an orderly Out of Africa colonization as a series of founder effects. However, the Eurasian portion of the pattern may also be spurious: current east Africans, for example, are partially admixed, both with West Eurasians and with people from other parts of the continent. Likewise, Arabians often have African admixture, whereas South Asians have been convincingly shown to be largely 2-way mixes of West Eurasians and "Ancestral South Indians". To top it all off, we now have convincing evidence that archaic admixture may have played a role in the evolution of some living Africans: this would furthermore increase their gene diversity and contribute to a perceived Eurasian cline. Tree models are orderly and well-behaved. It would be great if people behaved that way, because the math would be easier. But, people aren't laboratory mice that follow predefined paths in a maze: they mix with their neighbors, they split and move forward, but sometimes, they split and move backward. Hopefully, H&H's paper will lead to an increased appreciation of admixture in the human story, beyond the case of the Americas. Recent studies have concluded that the global pattern of neutral genetic diversity in humans reflects a series of founder effects and population movements associated with our recent expansion out of Africa. In contrast, regional studies tend to emphasize the significance of more complex patterns of colonization, gene flow, and secondary population movements in shaping patterns of diversity. 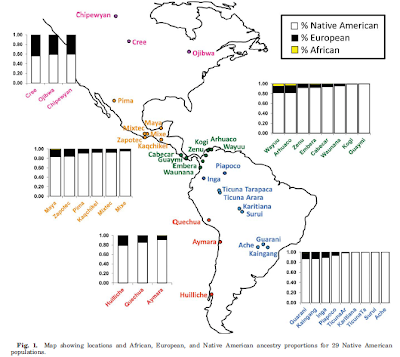 Our objective in this study is to examine how founder effects, gene flow, and European admixture have molded patterns of neutral genetic diversity in the Americas. Our strategy is to test the fit of a serial founder effects process to the pattern of neutral autosomal genetic variation and to examine the contribution of gene flow and European admixture to departures from fit. The genetic data consist of 678 autosomal microsatellite loci assayed by Wang and colleagues in 530 individuals in 29 widely distributed Native American populations. We find that previous evidence for serial founder effects in the Americas may be driven in part by high levels of European admixture in northern North America, intermediate levels in Central America, and low levels in eastern South America. Geographically patterned admixture may also account for previously reported genetic differences between Andean and Amazonian groups. Though admixture has obscured the precise details of precontact evolutionary processes, we find that genetic diversity is still largely hierarchically structured and that gene flow between neighboring groups has had surprisingly little impact on macrogeographic patterns of genetic diversity in the Americas. "[The skull] has got a much more primitive appearance, even though it is only 13,000 years old," said Chris Stringer, from London's Natural History Museum, who was part of the team of researchers. "This suggests that human evolution in Africa was more complex... the transition to modern humans was not a straight transition and then a cut off." The researchers say their findings also underscore a real lack of knowledge of human evolution in the region. My previous blog post on the published article here. A thing that has troubled me in reading a few recent palaeoanthropological comparative analyses is the fact that the Omo I, the "modern" of the ~195ka Omo skulls, as well as Herto do not seem to be included. Is this a case of anthropologists guarding their data, a problem that seems to have particularly plagued paleoanthropology? This is not an idle question: how would these ~200ka and ~150ka finds, widely touted as our ancestors fare when placed in the same analysis as the skulls of Harvati et al. (2011) or Mounier et al. (2011)? Omo II, the most "archaic" of the Omo skulls was included in Mounier et al. (2011) and seemed to be related to Skhul 5 and Jebel Irhoud 1, which would probably place it in the intermediate (archaic/modern) category. How about Omo I? I don't know, and I'd like to see some hard numbers on exactly how modern it is compared to extant humanity. It has often been repeated, for example, that the Skhul/Qafzeh hominins from the Levant represent an early Out-of-Africa movement, but they appear, at least in the latest Harvati et al. analysis to be well within the range of modern human variation, and certainly more so than all the included African samples of similar, or even younger age. This seems counterintuitive: if, as the current orthodox theory holds, modern humans -in the strict sense of being like living people- originated in Africa ~200ka and spread to the rest of the world ~60ka, why are the Mt. Carmel hominins apparently more modern than their African counterparts of similar age? Remember, that it has been hypothesized that Skhul/Qafzeh represent a population that may be mixing with Eurasian Neandertals, which would make them less like modern people, not more. Moreover, if modern humans did originate in Africa ~200ka, then why did they admix with archaic Africans only ~35ka (per Hammer et al. 2011) and had not replaced archaic Africans even ~13ka? Apparently, the current narrative proposes, they replaced all archaic hominins in Eurasia in practically a few thousands of years, but they could not achieve the same in nearly 0.2My in Africa? Or, they admixed with archaic Eurasians before they admixed with their next-door neighbors, the archaic Africans? Something does not seem right. How would Omo I and Herto fare if they had been included? Ancestral H. s. sapiens, where art thou? Let's find out. This is a nice physical anthropological complement to the recent Hammer et al. paper on archaic admixture in Africans. It is also added to a growing list of late survivals in the African palaeoanthropological record with apparent archaic features. As I have mentioned before, people have been too quick to generalize about "modern humans in Africa" from the early anatomically modern humans of eastern Africa, forgetting that our focus on them has been an artifact of the good geological conditions for preservation in that area, and the resulting overwhelming scientific interest in the region. But, eastern Africa is the periphery of Sub-Saharan Africa, and we are lucky to have new finds described from West Africa and elsewhere, as in this paper. I bet that a few years from now, we will look with amazement at the naivete of the passing Out of Africa orthodoxy that bundled all Africans into an amorphous category of "our ancestors in Africa". It is also becoming clearer that increased African genetic variation is, at least in part, due to the continent being home to multiple deeply divergent populations that persisted, in various admixtures down to the present. Symbols: Grey diamonds. Modern humans; Black up triangles: Upper Paleolithic modern humans; Purple up triangles: Late Pleistocene African and Near Eastern hominins; Red stars: H. neanderthalensis; Red squares: H. heidelbergensis (s.l. ); Black squares: H. erectus (s.l.). Ellipses indicate 95% confidence ellipses for Neanderthals (red) and modern humans (gray). 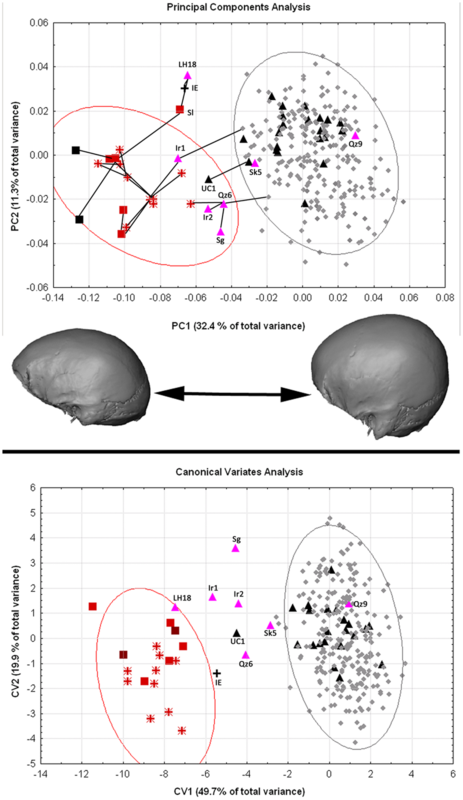 Modern human populations were characterized by more positive scores on PC 1, and there was only minimal overlap among their 95% confidence ellipses and that of the Neanderthals. The Middle-Late Pleistocene African specimens (LH 18, Singa, Djebel Irhoud 1 and 2) and the early modern human specimens from Qafzeh and Skhul fell in the intermediate zone between Neanderthals / H. heidelbergensis on one hand and modern humans on the other. Qafzeh 9 was the exception, falling on the positive end of PC 1 and close to Upper Paleolithic European specimens. 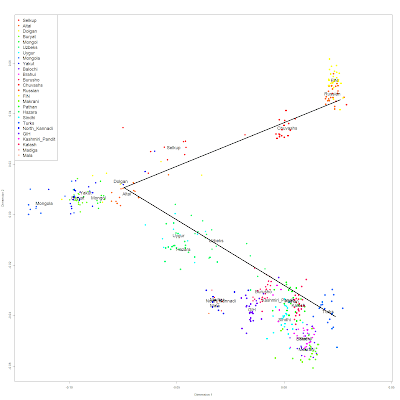 The latter sample, which included some of the earliest modern human specimens in Europe (Mladec 1 and 5, Oase 2, Muierii 1, Cioclovina), clustered within the modern human range of variation, and not in the zone of overlap with the archaic specimens. the similarity of Qafzeh 9 with Upper Paleolithic Europeans; geneticists had better stop inferring that the Skhul/Qafzeh hominids were the "first Out-of-Africa that failed"
the similarity of Qafzeh 6 with Upper Cave 1 from Zhoukoudian. If you have Qz9 and Qz6, i.e., more than 100,000 year old West Asian skulls clustering with Upper Paleolithic Europeans and East Asians, it is becoming increasingly difficult to maintain the naive Out-of-Africa orthodoxy that a recent Out-of-Africa push as late as 60,000 years is responsible for the peopling of Eurasia. This is especially the case when Qafzeh 9 may be the earliest unambiguously modern human with no "ifs and buts", with Skhul and Qz6 following close behind. Hi Dienekes, Unfortunately PLoS introduced a typo in the summary regarding the date, which should have read ~11.7–16.3 ka. Everyone please bear in mind the analysis only covered the superior cranial vault, as there was no face - I discuss the results further in my new book The Origin of Our Species. 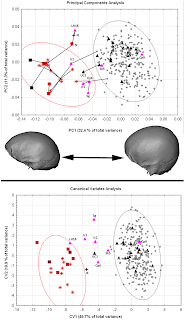 A 3-D geometric morphometric analysis of cranial landmarks and semilandmarks was conducted using a large comparative fossil and modern human sample. The measurements were collected in the form of three dimensional coordinates and processed using Generalized Procrustes Analysis. Principal components, canonical variates, Mahalanobis D2 and Procrustes distance analyses were performed. The results were further visualized by comparing specimen and mean configurations. Results point to a morphological similarity with late archaic African specimens dating to the Late Pleistocene. A long bone cortical fragment was made available for U-series analysis in order to re-date the specimen. The results (~11.7–6.3 ka) support a terminal Pleistocene chronology for the Iwo Eleru burial as was also suggested by the original radiocarbon dating results and by stratigraphic evidence. G was the third most popular choice in my recent poll. We now have G2a3 from Neolithic Linearbandkeramik in Derenburg and G2a in Treilles in addition to Ötzi from the Alps. G2a folk got around. He joins Stalin and Louis XVI as a famous G2a. It was already clear with the discovery of G2a in France and Central Europe, that this otherwise uncommon present-day haplogroup in Europe was more prominent during the Neolithic, and Ötzi's data point seals the case. In a sense, the triple G2a finds in Neolithic Europe confirm the origins of the European Neolithic population in West Asia, but renew the mystery as to how all the rest of the "players" of the European Y-DNA scene appeared on the scene, with everything except G and I first appearing in the ancient DNA record after the end of the Neolithic. Ötzi has been added to the ancient Y-chromosome studies page. In my comments on the recent Hammer et al. paper on Africa, I noted that the naive Out of Africa edifice has been shattered by recent discoveries, and attempts to patch it up by postulating a little admixture here, a little admixture there are largely unconvincing. We need a radically new model, so it was a nice surprise for me to see a new paper that attempts to do just that in a quantitative manner. We thus simulated the genealogy of 20 samples of 100-mtDNA sequences scattered over all Eurasia, and we estimated the fraction of these current lineages to be of Neanderthal ancestry by using a conservative interbreeding success of 2% for the hybrids. Among 10,000 simulations of this process, we could never observe any mitochondrial sequence of Neanderthal origin in our samples. We thus conclude that an interbreeding success smaller than 2% for Neanderthal-human hybrids is fully compatible with limited Neanderthal nuclear introgression and with no introgression of mtDNA. This is contradicted by another recent study by Ghirotto et al. focused entirely on the problem of Neandertal mtDNA (non)-intogression. I tend to side with G. et al. on this issue, as we currently have not only 100-strong samples from around the world, but, literally, tens of thousands of mtDNA samples, and perhaps even more if we account for commercial testing: no Neandertal sequences have turned up. So, I don't think it's the case that Neandertal mtDNA admixture is so low that we're not finding it in small (100-strong) samples. In any case, the current paper's major contribution is tackling the problem of the equidistribution of Neandertal admixture across Eurasia, despite the fact that Neandertal was a West Eurasian distributed species. The solution is simple: extend the Neandertal range eastwards, all the way to the Altai. That way, there is no mystery why French and Chinese have the same degree of Neandertal admixture: the former picked it up en route to France, the latter in their eastward journey to China. The extension of the Neandertal range to the east is supported by the close relationship of the Denisovan genome to Neandertals as well as the Okladnikov sample from Uzbekistan, so it is not simply a kludge, but a reasonably well-supported position. The expansion model also sidesteps the big elephant in the room: the fact that modern peoples are not necessarily descended primarily from the early modern humans who lived in the same localities as themselves. Neolithic and post-Neolithic events are increasingly thought to have shaped gene pools, so it is not clear, for example, to what extent the modern French are descended from Upper Paleolithic Europeans who ended up in France at the time when Neandertals were still in existence, and thus had the opportunity to mate with them along their route. Although we have modeled the Asian range to extend up to the Altai region north of the Himalayas, we cannot be certain that the ancestors of East Asians migrated through this region. 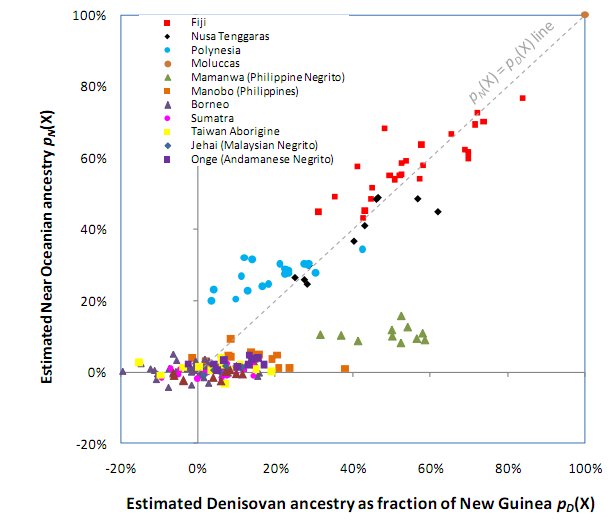 However, the facts that Papua New Guineans show signals of hybridization with another hominin (Denisovan) (2) and that their ancestors are likely to have followed a coastal southern route to the Pacific (19, 20) suggest that the Denisovan range must have extended more to the south and that the ancestors of East Asians may have indeed traveled north of the Himalayas, above the Denisovan range. 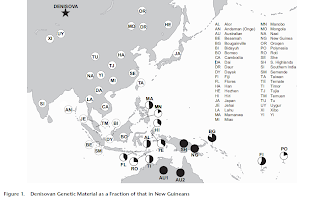 A northward migration route for East Asians and a southward one for Australo-Melanesians would solve the problem of "why Chinese are as Neandertal-admixed as the French" but would create a new problem of "why Papuans are also as Neandertal-admixed as the French", unless we derive everybody from the Altai. Under our model of hybridization during range expansions, similar amounts of Neanderthal ancestry in France and China (Fig. S2) are more often observed if the geographical range of Neanderthals extended up to the Altai Mountains north of the Himalayas. Indeed, a hybridization range restricted to Europe, the Middle East, and the Caucasus region (including the brown and green areas in Fig. 1) would always lead to a much larger Neanderthal introgression level in Europe than in China (Figs. S2 and S3, light bars). It is important to note the differences between this model and the one in the Reich et al. and Green et al. 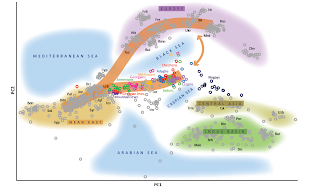 papers from last year; the latter postulated a brief, but relatively intense episode of admixture in West Asia, and the subsequent colonization of the world by (slightly Neandertal-admixed) modern humans with minimal subsequent admixture. The Currat & Excoffier favored model, on the other hand, posits exceptionally low admixture rates (or mostly infertile hybrids) but with repeating admixture events across a large geographical range that is extended far to the east. In any case, the C&E paper is an important contribution to the emerging new debate about human origins. The central prediction of their model, that modern human/Neandertal admixture was no easy thing is certainly consistent with everything we know about human behavior. Homogamy seems to be a tendency of our species, and heterogamy between populations separated by hundreds of thousands of years of separate evolution cannot have been frequent. Hopefully, next year, we will see even more realistic simulation studies that include the second elephant in the room, archaic admixture in Africans. The discovery that Africans possess a degree of archaic African admixture from Homo populations that branched off before the split of modern humans and Neandertals leads to the inevitable conclusion that Eurasians (who lack this archaic African admixture) would appear closer to Neandertals based on the D-statistic used by R&G. Happy were the days when human evolution could be viewed as a simple tree branching process, but now we have at least four players in the field (modern humans, Neandertals, Denisovans, archaic Africans) and we are bound to have new full ancient H. sapiens genomes. Things are bound to get more interesting. with some later secondary contacts in Eastern Asia. have followed a migration route North of the Himalayas. With respect to point #1, I acknowledge that the C&E model does not explicitly choose either a northern or southern migration route for the ancestors of the Chinese. However, I do believe that it effectively chooses a mainly northern route. This is a simple consequence of geometry: concentric radiation of migrants results in more migrants flowing through the larger volume of the interior of the Eurasian continent (where they would have the opportunity to admix with eastern Neandertals) rather than through the narrower coastal band (where they would not). It is also an interesting question whether the concentric model would lead to non-distinguishable admixture levels in East Asians and Australo-Melanesians, since -under the concentric migration model- the latter would mostly travel through regions of low-to-non-existent Neandertal occupation, whereas the former would not. First, the published ancient DNA work, which showed a chasm between Mesolithic and modern mtDNA in central Europe, and seemingly non-existence of the main current European Y-haplogroup R1 in both Central Europe and France Neolithic sites (Treilles). Second, the observation of Fst values between European and West Asian populations are approximately 1/3 of those between West and East Eurasians. 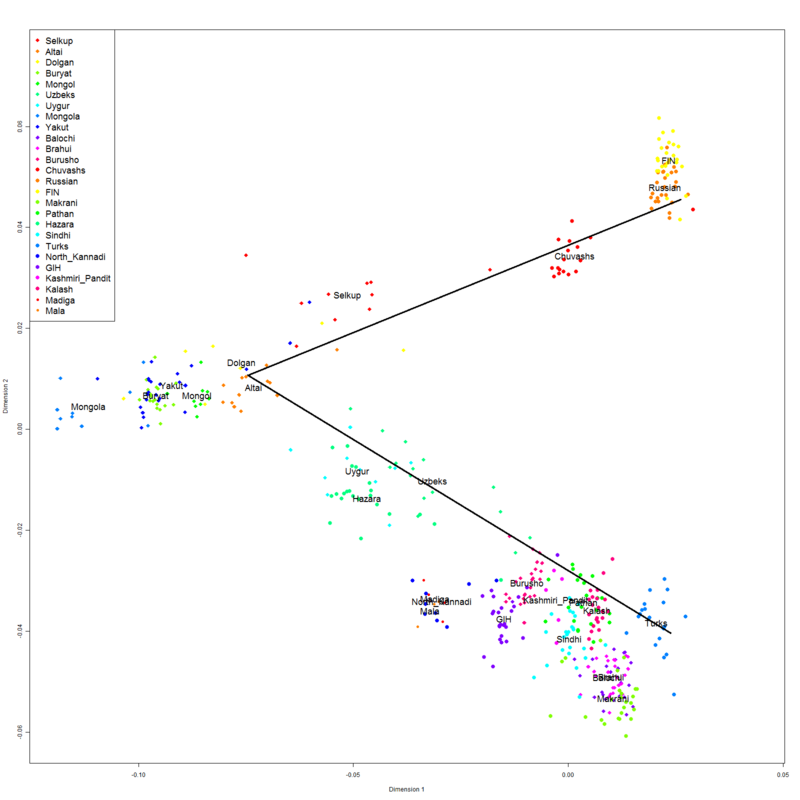 If the separation between Europeans and West Asians was effected close to the time of the Upper Paleolithic colonization of Europe (40ky), and would thus have diverged genetically only slightly less than West Eurasians and East Asians have. The issue can only be settled, of course, if we are ever lucky enough to obtain ancient DNA from Upper Paleolithic Europeans. Recent studies have revealed that 2–3% of the genome of non-Africans might come from Neanderthals, suggesting a more complex scenario of modern human evolution than previously anticipated. In this paper, we use a model of admixture during a spatial expansion to study the hybridization of Neanderthals with modern humans during their spread out of Africa. We find that observed low levels of Neanderthal ancestry in Eurasians are compatible with a very low rate of interbreeding (<2%), potentially attributable to a very strong avoidance of interspecific matings, a low fitness of hybrids, or both. These results suggesting the presence of very effective barriers to gene flow between the two species are robust to uncertainties about the exact demography of the Paleolithic populations, and they are also found to be compatible with the observed lack of mtDNA introgression. Our model additionally suggests that similarly low levels of introgression in Europe and Asia may result from distinct admixture events having occurred beyond the Middle East, after the split of Europeans and Asians. This hypothesis could be tested because it predicts that different components of Neanderthal ancestry should be present in Europeans and in Asians.